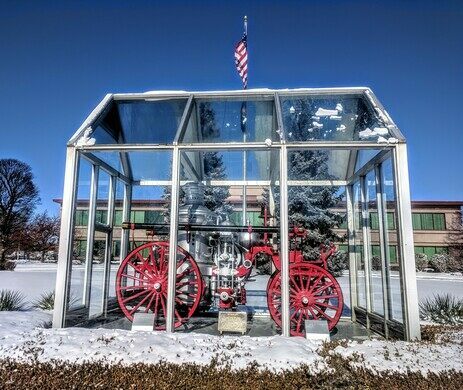 Displayed in a handsome glass case on the front lawn of the headquarters of Michigan Millers Insurance Company in Lansing is an 1858 horse-drawn steam pumper fire engine. 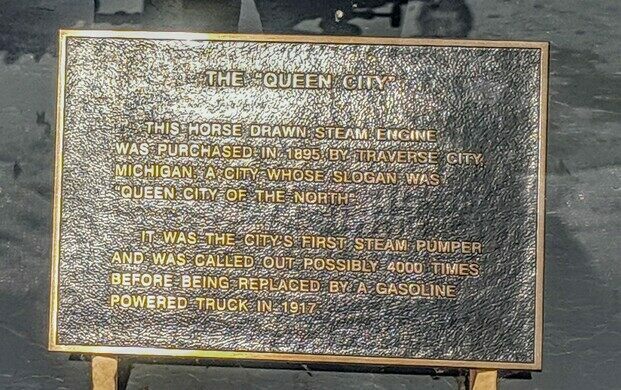 The ornate, Victorian-era fire engine is named “The Queen City” and was purchased by the Traverse City Fire Department in 1895. Perched atop a brick smokestack, this enormous lug nut symbolizes the local minor league baseball team. After its retirement, the old fire engine was put on display for the public to admire. This lets both locals and visitors appreciate the skilled craftmanship that went into building his piece of fire-fighting history from more than 150 years ago. Today, it sits securely within its own special see-through building. 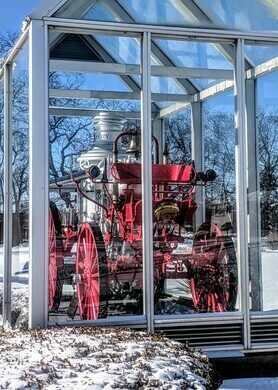 The glass case protects the fire engine from the variability of Michigan weather, ensuring it’ll remain easily viewable for years to come. The fire engine and case are very visible from East Grand River Avenue. In this vicinity, East Grand River Avenue is a one-way street headed westbound. Off-street parking is available on the property. This experiment in the lifespan of seeds will take a century before it is complete. Housed in the university planetarium, the thousand-strong collection of tiny towelettes includes a used one from the hosts of Car Talk.